This volume contains nearly the entire creative output of Hans Holbein the Younger's Basel period, i.e. the productive and innovative years between 1515 and 1532. In contrast to his later work in England, where he was active primarily as a portraitist and a designer at court, the Basel years were varied and multifaceted. This publication also includes a series of essays by distinguished Holbein scholars. These cover Holbein's artistic development, analyze his graphic works, shed light on his religious panel paintings and focus on individual works and work complexes such as the woodcut series of the Images of Death. Holbein's artistic career, his patrons and his relationship to antique and contemporary art theory are also discussed. 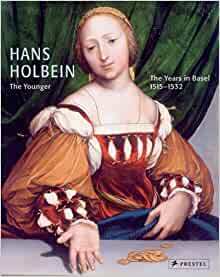 This book offers a comprehensive overview of Holbein's early career in Basel. It's a beautifully presented book with gorgeous reproductions of his work. Highly recommended to anyone interested in Holbein or German Renaissance art. This is a really rather disappointing book, and one of those internet purchases I would definately return were it not that the postage would cost more than the refund! There are very few paintings (did Holbein really paint so little during his years in Basel? ), and most of this terribly thick tome is filled with rather gloomy drawings and prints. This might be something for the scholar but certainly not if you are looking for a visual treat or to see lots of new paintings.